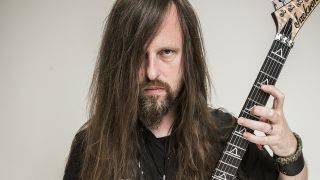 The widow of All That Remains guitarist Oli Herbert has officially revealed how her husband died. Herbert died last month, with initial reports suggesting he died as a result of an accident at his home. Now the toxicology reports have been released, with his widow Beth issuing a statement to let fans know. She says in a Facebook post: “Toxicology results are back as is the official cause of my husband's death. Cause of death – drowning. “Toxicology: Oli was apparently self-treating for manic-depression that has run in his family for several generations. Anti-depressants were found in his system, as well as a sleep aid. “The psych meds found in his system were the same ones that a close relative has been prescribed for a long time, so he knew what to hunt down for the ‘treatment'. A public memorial service was due to be held for Herbert yesterday, but it was cancelled last week. Beth has now explained that decision. Beth has also urged anyone who knows where Herbert was getting the psych meds from to contact local police. All That Remains are currently asking fans to submit their guitar covers to honour Herbert’s legacy. Find out more.